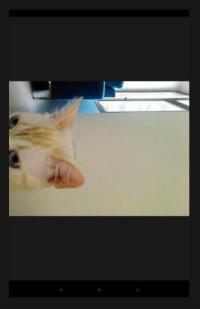 Snapcat is the very first social photo sharing app for cats, featuring photos taken by cats. Developed in just 24 hours during EyeEm's Photo Hack Day 3 in Berlin, this Android app allows cat owners to punch up their cats' snaps and post them to social networks such as EyeEm, Facebook and Twitter. So easy even a cave man, er, cave cat can do it? So it would seem: Snapcat operates intuitively from the cat's point of view, requiring the cat to merely exercise their well-known propensity to chase a red laser pointer light. In this case, the light is a red ball on any Android smartphone's touchscreen. Details are a bit sketchy but in a nutshell, the cat hits the red ball (smartphone owners may cringe at this) with their paw which activates the app and causes the ball to vanish. Presumably after a slight delay while the cat withdraws its paw, the smartphone's camera snaps the cat's photo, saves it, and starts the cycle anew. 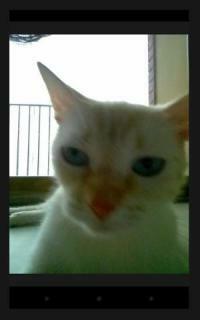 At some later time, the cat owner can access the photos and edit with filters or stickers from Aviary, and then share the results through social networking. It all sounds simple, easy and straightforward whether you're a cat or a cat owner but perhaps there are a few bugs left to be worked out – comments at Snapcat's Facebook page mention some frustration in getting the app to work as described as well as problems saving and displaying photos in the gallery.